We met Stephanie at the PETA charity fashion show, but didn't actually recognise that she'd been in the Hot Sauce video too. Stephanie lives only 5 minutes from us, so it was really easy to squeeze in an evening shoot. Make-up was by Ruth Evans - Stephanie was her first airbrush victim with us (I'd told her that it shouldn't hurt as much as a tattoo, but she found it surprisingly painless). Stephanie is relatively new to modelling, so there was a certain degree of keep on shooting until she relaxed - in reviewing the whole shoot there is a definite improvement as the shoot progressed. We might have shot more, but when we did finish there was 4" snow and Ruth had to get home (she should have stayed the night because she didn't make it home). The EPS Creative Group finish the year with the Cunningham Cup competition. The entry for this is a group of three related images - these are awarded marks individually and together as a group (for a total of 40 points). The standard of the entries was really very high - lots of really nice work on display. They were very well received (8,8,9 & 8 for the set), but tonight's judge, George Neilson (EPS), felt that as a set they would have been a considerably stronger entry if they had been more consistent feel through the whole set. I can't argue with that - they weren't shot with that in mind and the middle shot has a very distinctive colour treatment. The first shot is really just a record shot after approximately the first forty minutes, the second shot is the final result after close to four and a half hours and the last shot is from the sequence of Kumi removing the latex cap as we finished. I was really pleased how much George liked them and particularly surprised that he marked the final shot higher than the other two. We both entered for the members' exhibition (the entry is a set of four images). I got an Honourable Mention for my set of four images. 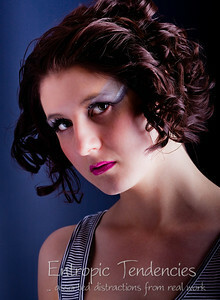 Studio shoot with Gilda Lily 27/03/10 - make-up by Lorraine Brown. 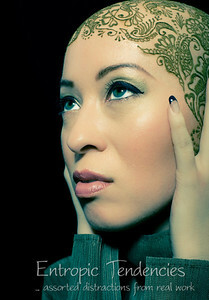 This is our second shoot with Ingrida, but our first time working with Lorraine. Nick Vidler had advertised this studio lighting workshop session on UKPM. It was held at Contrast Studios in Glasgow and Brit Lee was the model for the day. The biggest value for me was the opportunity to dedicate some time purely to practice and learn. It was a good crowd and the group discussion was also invaluable - all in all, a fun day. It was good to confirm that we've not been doing it all wrong - a lightmeter might refine what we're doing and overall we'll just be more confident. If you're starting out or even just want some practice, I'd recommend this or a similar event with Nick. A relaxed pace and a friendly atmosphere, only six photographers and Brit as the model for an eight hour session - for what I consider a reasonable price. I received my copy of the second UKPM.mag book today and got a very nice surprise to find an unexpected extra shot entered by Kirsty269. The book is intended to showcase the work of the UKPM members. Blurb are offering free shipping until 22nd March with the coupon WESHIP2. This weekend's shoot with Miel ended up all studio - make-up by Sam Brown (SB Make-Up). We hadn't worked with either before, but I'd at least met Miel briefly at one of Greig's Glasgow networking nights. Headshots, headshots ... and more headshots. We started clean and simple and worked up to the alien look with mottling on the neck and around the face. The main light was my beauty dish (left of camera) and the large gridded softbox to my right (and forward) at very low power (or off). The background is my (now) standard charcoal seamless with a gel covered light to provide the colour. I thought I was disappointed with my scores from the last monthly competition, but tonight's Creative Group competition left me scunnered (judged by Richard Bingham (EPS)). Unfortunately we were on our way home from Focus 2010 (NEC, Birmingham) so all comments are second-hand and may not quite reflect Richard's phrasing or intent. Apparently the creativity is down to the make-up artist (congratulations Ruth), Billie's eyebrows are a different colour from her hair (! - not sure how that would affect the score, but judges are often like sports commentators) and there is a distracting shadow to the left of her nose - but least the eyes are sharp. Having had a brief discussion with Richard on the scoring, his interpretation or application of the guidance (10 marks for technical, 10 for creativity) appears to have been inconsistent with the other judges in the Creative Group competitions this season (and very little of my work would be of value in the Creative Group).